Non alcoholic mixed drinks that have frothy head when made and are served in chilled beer or pint glasses. Peppemint Fizz. A blast from my past repertoire of recipes from years back. Like Ebneezer Scrooge, this Christmas I was reminded back to my past, maybe not by a magical being but definitely to show me something I had forgotten. When I first was interested in the idea of non alcoholic drinks, I did most of my searching through recipe books, and wrote my favourite ideas on index cards which I kept and remembered (sort of). 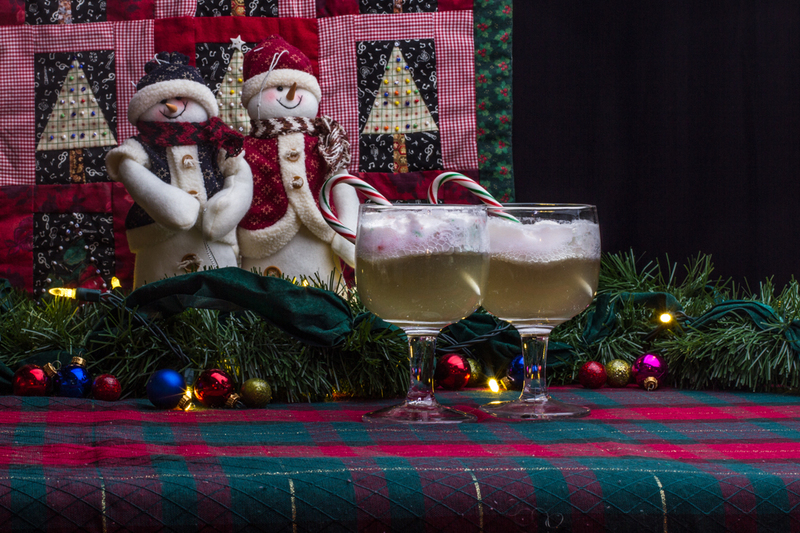 So after some searching I was able to find a recipe that I remembered fondly from my youth: Peppermint Fizz, a Christmas drink using crushed candy canes as the flavouring. I have no idea where this recipe came from, as I wasn’t big on documenting my sources back then. When I look up the drink online, I come up with a strawberry shortcake character, and a drink that is brandy, peppermint schnapps and lemon juice which isn’t even close to the recipe on my index card. So this Christmas Season, why not review a blast from the past and move the first of my index card recipes into todays world of the web! This is a great recipe to make with the candy canes Santa brought this year. Whip cream to a custard consistency and fold in crushed candy. Freeze in ice cube trays. To serve place an mint cream ice cube into a tall glass or wine glass and fill with chilled pop. Stir slightly and serve with a pretty spoon, straw or candy cane to mix drink with. This recipe is for a crowd, or for the whole 12 days of Christmas if you, like scrooge, don’t like to share. When I first remembered this recipe I made a small batch but was in a hurry and didn’t freeze the cream and candy into cubes, instead adding a dollop of whipped cream to the top of a glass of gingerale. The result was not the same, I recommend giving the cream and candy time to meld flavours and the frozen cubes slow the fizz process down, requiring more stirring, and we all found that similar to a float, we could add more pop and keep enjoying the drink. If you want to make many drinks keep your peppermint cubes to about 2 tbsp of mix, the cubes will blend better with the gingerale and while seconds with the same peppermint cube may not be possible, the initial drink will be delightfully pepperminty. I served this to some guests who dropped by and got positive reviews from everyone. This is a great thing to have for just that purpose, and I plan on keeping some of these cubes in the freezer this holiday to offer visitors. Merry Christmas! Simplicity: 5/5 three ingredient and some patience. That’s it!! Ingredient finding: 4/5 seasonal only, even up in Santa’s part of the world candy canes are only available at Christmas!